The Steam Laser Mk. II (Broken!) is a Hydro type weapon, which results from catching Icewing with Steam Laser Mk. II. Oh no! Just look what Icewing did to this perfectly good trap! Does she even know how long it took to build? The effort and time and gold involved? Does she even care? Well. You can show her! There's certainly enough parts left here to rebuild this trap, and if you can find an extra-powerful power source somewhere, you can create a trap she'll certainly fear! The Steam Laser Mk. II (Broken!) is not sold by any Trapsmith. It can only be obtained by catching Icewing with Steam Laser Mk. II. Smashing this weapon with the Hunter's Hammer yields Steam Laser Mk. II Parts. 24 May 2012: The Steam Laser Mk. II (Broken!) was introduced. 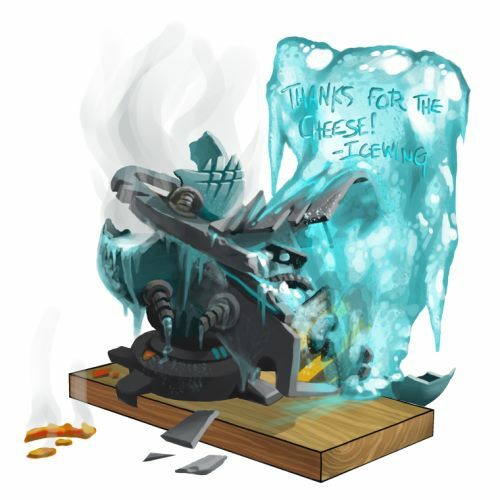 The image of the trap includes the message "THANKS FOR THE CHEESE! —ICEWING". This page was last edited on 12 January 2019, at 13:36.